Once you have created a Web Export account for your blog in Preferences you can post any of your lessons using the Blog/Web export feature. If you have a lesson open click on the Export button and select Blog/Web. Alternatively you can use the File -> Export Lesson -> Blog/Web menu. Note that you can also export a lesson from the Lesson Library lesson list by using the File menu or by right-clicking on the lesson and selecting Export -> Blog/Web from the contextual menu. Before uploading the lesson to your blog for the first time you can configure a couple of options. You begin by selecting the Account you would like to upload the lesson to (1). This is an account that you have created in the Web Export preference pane. Next you configure some of the properties of the lesson. 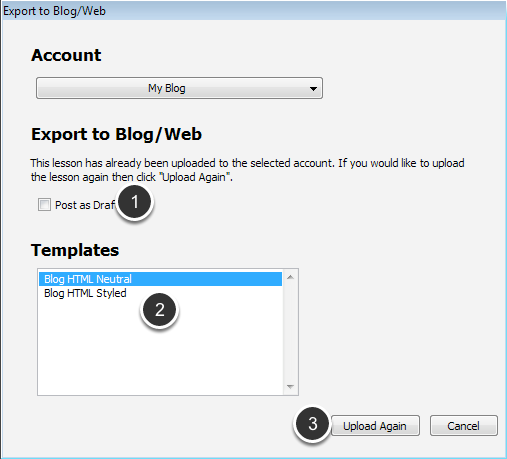 If your blog server supports multiple blogs you can specify which blog to upload to lesson to (2). You can also specify a category for the lesson (3) as well as whether or not to post the lesson as a draft and/or page (4). Once you have configured the lesson properties for the blog post you can choose a template (5). The template determines the formatting that will be used to display the lesson in your blog. Once you are done configuring the various options click the Upload button to begin uploading the lesson. A progress dialog will appear while the lesson text and images are uploaded. If all goes well then this dialog will appear. Use the Copy URL to Clipboard button if you would like to email the url to your lesson to somebody. When you export a lesson to a blog ScreenSteps remembers the fact that you did so. 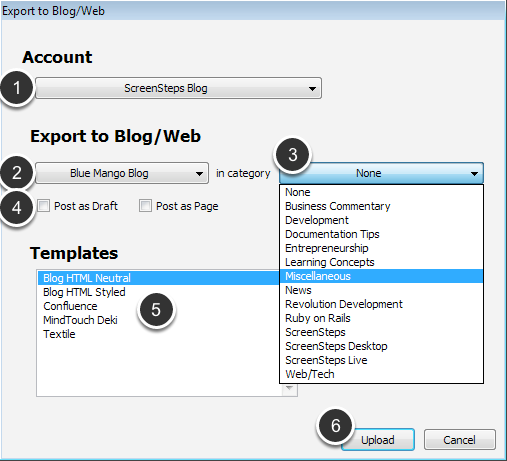 If you attempt to export the lesson to the same blog again the Export to Blog/Web dialog will appear slightly different. You can still specify whether or not to post as a draft (1) and which template to use (2) but you cannot change the category. Clicking the Upload Again (3) button will replace the existing blog post. I had a manual that was also published to our blog. We added a second product with many of the same/similar instructions. So, I created a new project and I copied nearly all the lessons from the first manual to the new one. It is a new manual and I've even set up a new HTML export link (forgetting that isn't where I set the category). My problem is I can't export these lessons to our blog to a different category (e.g., "Product 2 User Guide"). It is still recognizing them as published from the first manual (most share the same lesson titles) and if I try to publish them it reads them as already published (therefore would rewrite the other manual lessons). I need to publish these as totally new content. How can I disassociate them from the original? Jill - it seems that when you duplicated the manual that you referenced the old lessons rather than made new copies of them. 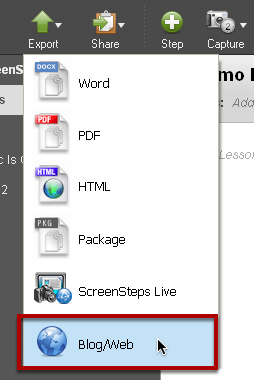 ScreenSteps allows a lesson to appear in more than one manual so you are given this option when you choose to duplicate. Take a look at this lesson. I would suggest starting over and make sure you make copies of the lessons when you duplicate the original manual. is there a way to export all the lessons at once? @Tim: No, there is not. Thanks for a quick response, i wasent expecting that so thats really great. So how would you recommend moving 200 lessons from screensteps to a wordpress site? @Tim: With ScreenSteps 2 I don't know that there is a better option then just exporting one at a time. It will be slow but I don't know of a faster way to do it. With our hosted service we are going to start beta testing a WordPress exporter. Basically you specify manuals on our hosted service that you want to sync to WordPress and then our server updates Wordpress every time you make changes. You get the benefit of our authoring environment but content is pushed into your delivery platform (WordPress in this case). If you are interested in more information just email support@bluemangolearning.com and let us know.